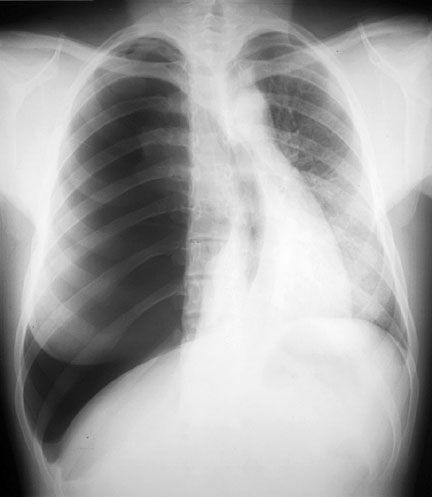 To take this chest x-ray is a common error for those without experience. The diagnosis of Tension-type pneumothorax is a clinical one. That is because it’s a real emergency (inmediately life-threatening), that should be identified on primary survey. Distended neck veins (this could be absent if your patient is hypovolemic. Mechanism: The air enters to the pleural space (a virtual one) and cannot escape, then the intrapleural pressure increases and the lung becomes collapsed with secondary shift of the mediastinal contents to the opposite side. Treatment: Needle decompression (thoracostomy) with large-bore needle in the second intercostal space in the midclavicular line to convert the tension pneumothorax into a simple pneumothorax. This simple procedure can save your patient’s life. Be aware, explore your patient, establish a diagnosis and give a prompt and proper treatment. Chris, feel free to use any content of this site with propper credit. Hey – hope you don’t mind, I’ve used this picture for our Tension Pneumothorax page, over on MedRevise (a free medical revision wiki). If you aren’t happy with that, I can take it off. I just can’t believe that… as you say so right: “even with the diagnosis staring them in the face”. I agree. When I was a 4th year medical student, I had just finished a rotation on the trauma service and was on an ICU rotation. My interns/residents were all internal medicine. I was all set to be a surgeon and firmly believed, “Nothing heals like cold hard steel.” One of the residents had attempted an IJ line and the patient became very dyspneic. As you can expect, shifted trachea, distended neck veins, decreased breath sound, hypertympani, etc. I suggested a needle thoracostomy. Ignored, of course. They got an x-ray and then, even with the diagnosis staring them in the face, consulted general surgery for a chest tube. The surgery resident walked in, pulled a 14g catheter out of his pocket and stuck it in the patient’s chest. Immediate relief.